I found this project on the web but it did not have instructions along with. empty tomato can ( I used safeway diced tomato can). paper clovers cut out of construction paper (different kinds of green). I would make one of mine a lucky clover. some tissue paper (any kind of green) shredded into strips. Take the barbecue skewers and paste clovers on the tip one on each side of one tip of the skewer so that you cannot see the skewer tip. Make many stems of this kind. 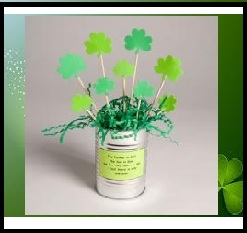 Put some shredded tissue paper in the can and arrange clover stems in the empty can. Fill the can with remaining shredded tissue papers. You can now decorate your can with stickers as my son did or with green permanent markers as his friend did.